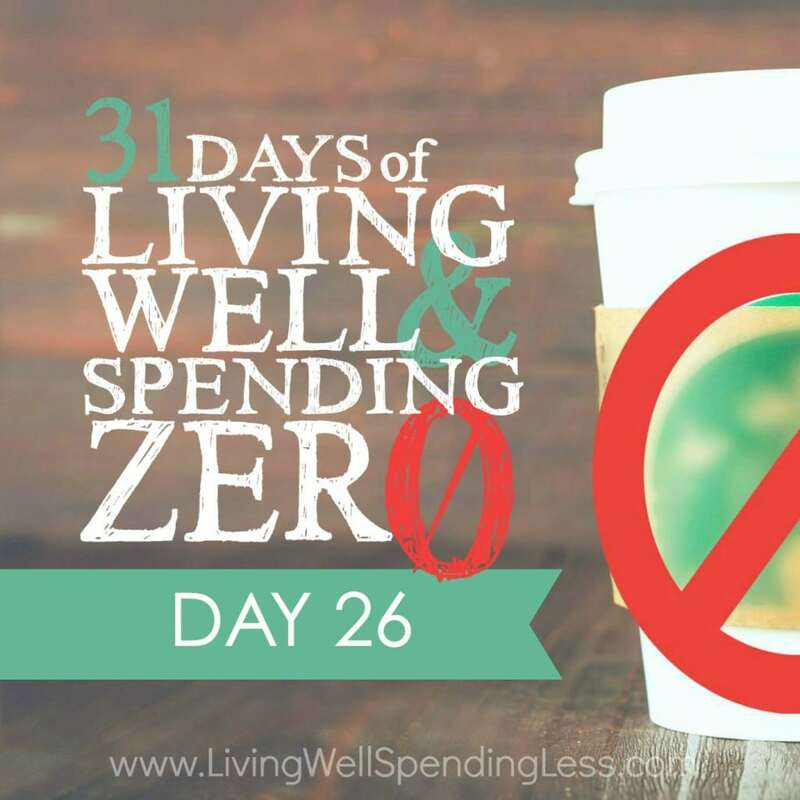 This is the twenty-sixth day of our 31 Days of Living Well & Spending Zero challenge. Start with Day One here. So this week we’ve found ways to get free items, earn a little extra money, and we started to barter, so now it’s time to shift our focus and look at how we can spend a little time with our loved ones for free. As I discussed in Day 20 when we had a spa day, just because you’re saving money doesn’t mean you need to feel like you’re “punishing” yourself. You still deserve to have enjoyment, happiness, and caring in your life. All of us do. Part of that includes our relationship with our spouse or significant other. Even if you’re a single parent, you still need a night out once in a while! Unfortunately, nights out can cost money. Dinner and a movie (with a babysitter, a glass of wine at dinner, and popcorn during the flick) can set you back almost $100. Yikes! It’s time to get creative! Spending time with loved ones is good for your health, and theirs. It gives you an opportunity to reconnect, and it’s critical for the vitality of your marriage or relationship (or even friendship). Yesterday you mastered the art of bartering, so you should have babysitting taken care of. If for some reason you don’t—that’s your first goal. Secure babysitting so you can get away and enjoy a little time one-on-one! Then use one of these ideas to create a memorable date. Go stargazing—find a place away from the city lights. Bring a blanket and pillows so you can cuddle while you soak in the night sky. Make the evening even sweeter with a thermos of homemade spiked cocoa! Tour a local winery or brewery—some breweries and many wineries offer free tours, which usually include a sample or tasting at the end! Donate blood together and get a free movie ticket—I’m not sure if this is done anywhere else, but in my town any time you donate blood you receive a free movie ticket. Why not make an evening of it? First do some good and then enjoy a free movie (plus you get free cookies at the blood bank)! Volunteer together—serve at a local soup kitchen or food bank, spend a day building together for Habitat for Humanity, or simply spend a few hours picking up litter in a neglected area of town. There are so many opportunities for giving back! Go hiking—this is one thing I really miss about the Pacific Northwest! Research local trails, then head off to explore. For most trails you won’t need any special gear, just comfortable shoes and a backpack with water and snacks. Do a crossword together—before kids, this used to be our favorite Saturday morning activity! We’d cook a big breakfast then break out the crossword puzzle, refusing to give up until we’d filled in every last square. Have a picnic in the park—pack a few treats and a bottle of wine and spend the evening dining alfresco at your favorite park. Even when the weather gets a little cooler, this is a great option. Just take a few extra blankets for cuddling! Cook or bake together—why not spend the evening trying out a brand new recipe? You could learn to bake bread from scratch, make cookies, or simply prepare and share a meal. If you want to “eat out” at home you could attempt a few of the restaurant copycat recipes from Day 5. Attend a free concert, speech, or book reading—most communities have free events happening every week, whether it’s a free concert in the park, a reading at a local bookstore, or a speaker at your library or university. Check out your library, chamber of commerce, and colleges online, or a local paper to see what’s going on. Attend a free art show—explore the works of up-and-coming artists by touring one or two art galleries in town. In addition, many art museums offer free entrance nights for community members. Play a game—board games and card games are such a nice way to spend time as a couple. Even puzzles can be fun! Our favorite two-person games include Scrabble, Bananagrams, Skip-Bo, Phase 10, and Canasta (played with two decks of playing cards). Have a movie night at home—watch a favorite movie you already have, or check one out for free from the library. Most libraries have an extensive selection of movies to choose from. Make it special by adding homemade popcorn, hot chocolate, fondue, or other goodies. Visit a farmers market or street fair—spend a morning checking out the work of local artisans. Many food booths give out free samples of their wares, and there’s often music or entertainment going on as well. Go for a drive—if you live in a relatively scenic area, spend some time just driving around to check out the sights. In the fall you might do a color tour, and during holidays you could check out lighted homes. Or drive through a pretty neighborhood to get landscaping ideas. Have a spa day—use the recipes from Day 19 to create a romantic spa date for two. Enjoy a romantic candlelit bath together then take turns giving foot rubs or back massages. Even the most masculine of men would have a hard time saying no to that! Take a free class—check out free classes offered by local community colleges, libraries, or retail stores. Shops like Pottery Barn and Williams-Sonoma offer free decorating and cooking classes, while colleges and libraries often have classes available on a variety of topics. Wash the car together—nothing says romance like a bucket of soapy water and a nice clean car! Doing chores together can actually be very meaningful. You get quality time in, plus much-needed tasks get checked off the list—a double bonus! Explore a nearby tourist town—is there a popular town nearby that you’ve never visited, simply because it’s “just a tourist trap”? Stop by the visitor’s bureau or chamber of commerce for some informational brochures, then spend the day taking a mini vacation in your own backyard. Attend a local drum circle or jam night—many parks and beaches host jam nights or drum circles where local musicians, both professional and amateur, get together and just play. It’s generally open to anyone and you don’t have to play an instrument to simply sit and listen. Go foraging—check out a book on foraging for mushrooms, ramps, leeks, fiddleheads, and other edible finds, and go on a hunt! You’ll be surprised at what you can discover in parks and woods. Park—I’m not talking about that kind of parking (although that could be fun too! ); I’m talking about actually going to the park. If you have dog, check out the local dog park. Try Frisbee golf at a local disc golf course, as most are free. Even channel your inner kid by sitting on the swings and talking. Catch a game—maybe you can’t afford NFL or MLB tickets, but you can check out a local high school basketball or football game. Cheer on your team and relive his glory days under the Friday night lights. It might take you right back to high school. Race each other—if you both like to run, head out for a jog together. If walking is more your speed, just stroll around the neighborhood, hold hands, and talk. Go for a spin—break out your bicycles and go on a little trip around the neighborhood. You don’t have to aim for the Tour de France. Take it slow and enjoy the scenery. Have a destination in mind, or simply go for a random trip through your city. Take a walk down memory lane—dig out the scrapbooks and old photos and remember things you’ve done together. For even more romance, reread cards and love letters. If you’re feeling inspired, put away some of those precious memories in a time capsule that you will dig up in ten, fifteen, or twenty years. Talk about romance! People watch—remember when you and your spouse were full of inside jokes? Sit on a bench in a busy area or mall and people watch. Make up stories and just observe. Get artistic—guys can be surprisingly creative. What does your husband enjoy? Model building? Drawing? Painting? Figure out how to scratch that creative itch and try making something together. Not only will you bond, but you’ll have something fun to show for it. Get dirty—just like washing the car together, doing yard work can also be pretty fun. Pick a patch of your yard that needs a little weeding or tidying up, and do it together. Take a nap—quite honestly, sometimes when you have a babysitter, it’s nice to just have a little uninterrupted time together, even if it’s just snuggling up on the couch for a nap. Today’s assignment? Plan a fabulous free date night for you and your honey! Have fun, you crazy kids. Do you have any other fun ideas for a free date night?